This transformation involves longer and more complex supply chains as well as increasing demand for foods such as fish, milk, fresh vegetables, and oil, and sugar. The dietary transition has not been uniform: although nutrition is improving, many are still consuming diets lacking essential nutrients. Still others overconsume, introducing problems with obesity and diet-related diseases such as diabetes. To successfully navigate this transformation, food systems must be viewed as a whole, beginning with the consumption of healthy diets—that is, increasing the consumption of diverse and healthy foods while controlling the intake of unhealthy foods. The process encompasses production, processing, distribution, marketing, consumption, and food waste. This approach enables policy makers and food system actors to understand the complex tradeoffs and potential impacts of innovations, regulations, and policies on the sustainability and health of food systems. To facilitate this understanding, IFPRI’s Policy Research and Strategy Support Program (PRSSP), together with CGIAR Research Program on Agriculture for Nutrition and Health (A4NH) and Wageningen University and Research (WUR) in the Netherlands, organized a workshop and country consultation this week in Dhaka with key government and food system actors to develop a program on food systems research. “It is not enough to look at individual commodities or policies – we have to look at how they come together as a system to form a diet, and diets are changing,” noted John McDermott, A4NH Director. Food Systems for Healthier Diets is such a central issue to A4NH’s research agenda that it is one of five pillars, or flagships, of the program. This flagship is led by Wageningen University and Research, which has a strong history of work on food systems. “Dietary diversity is key for promoting food systems for healthier diets. IFPRI research in Bangladesh shows that agricultural diversity and nutrition knowledge improve dietary diversity,” stated IFPRI Country Representative for Bangladesh Akhter Ahmed. These research findings motivated the design of the “Agriculture, Nutrition, and Gender Linkages” pilot project, which was designed by IFPRI, is being implemented by the Ministry of Agriculture, and is jointly funded by the Government of Bangladesh and USAID. The ANGeL pilot project demonstrates the Government of Bangladesh’s commitment to strengthening food systems. 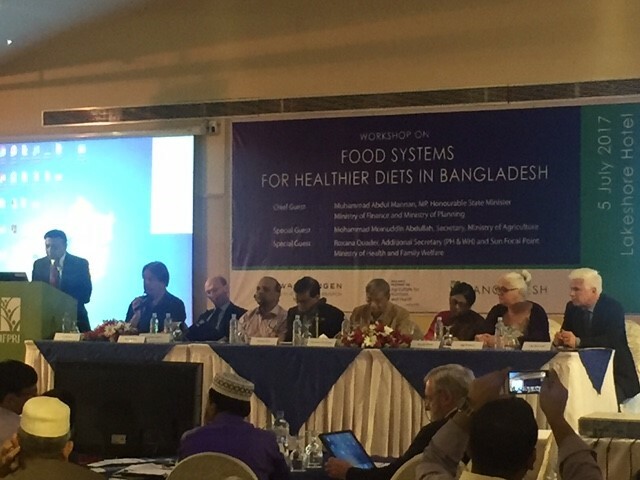 The workshop begins the process of securing food systems for healthier diets in Bangladesh, as stakeholders diagnose the situation and look ahead. Moving forward, they will consider developing a program to manage diet change, innovations, and impacts, as well as how to scale up and secure strategies to benefit people across the country. The International Food Policy Research Institute (IFPRI) is an international agricultural research organization that provides research-based policy solutions to sustainably reduce poverty and end hunger and malnutrition in developing countries. CGIAR Research Program on Agriculture for Nutrition and Health (A4NH), CGIAR’s only research program on nutrition and health, is led by IFPRI and guided by six other managing partners. A4NH carries out research activities through five unique, yet complementary, flagship programs and three cross-cutting units in at least 30 countries. Wageningen University and Research Centre (WUR) in The Netherlands is a research institution that focuses on the domain ‘healthy food and living conditions’ for governments and the business community-at-large. WUR develops top-quality expertise, helps to translate knowledge into practice worldwide and trains professionals who, in the near and distant future, will discover breakthroughs in science and technology.